Today i received a email from Illamasqua regarding the Sophie Lancaster foundation that i wanted to share with you. If you are unaware, the Sophie Lancaster Foundation was set up just over 4 years ago after the death of Sophie Lancaster purely for looking unique and different. More information on this amazing charity can be found on their Website and Facebook Page. 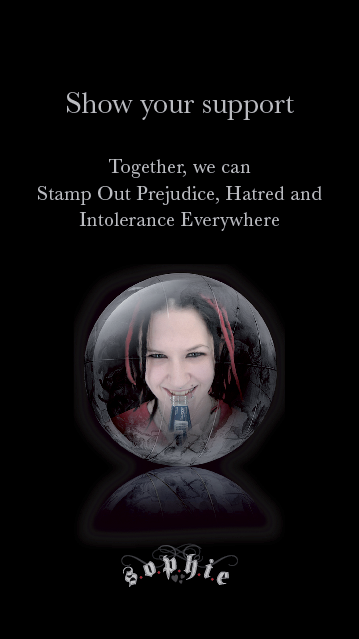 The Sophie Lancaster Foundation aims to Stamp Out Prejudice, Hatred and Intolerance Everywhere. To work in conjunction with politicians and police forces to ensure individuals who are part of subcultures are protected by the law. A week tomorrow, Saturday 26th November would have been Sophies 25th Birthday. In honour of Sophie's birthday and to mark their support for the Sophie Lancaster Foundation, Illamasqua are hosting an internationally open competition to win a selection of cult pieces from the Illamasqua collection, including Medium Pencil in Sophie, Pure Pigment in Zeitgeist, Nail Varnish in Unnatural, Intense Lipgloss in Repulse, False Eye Lashes in no.21 and a S.O.P.H.I.E wristband. I urge you all to get involved for this amazing and so very worthwhile charity! Such a worthwhile foundation/charity, definitely going to enter the competition too. thanks for being so swesome to spread this awareness! The story of Sophie always hits home. My bf lives around the area that happened and its easy to forget these things happen when we are tucked away in unis or in the city. So fantastic of Illamasqua to help spread the word about charities like this. Being individual is amazing and beautiful and who better to express this than them? !